London, England. Publisher: Simpkin,Marshall & Co.. Editor: Arthur Lovell. Lovell (real name David Coethyr-Williams, 1864-) was an English (or rather, Welsh) version of the New Thought teacher that was coming to predominate in America at the time. He emphasized concentration and the will (Volo) as The Secret of Acquiring Mental and Bodily Vigour (the name of one of his Ars Vivendi series of self-help books). 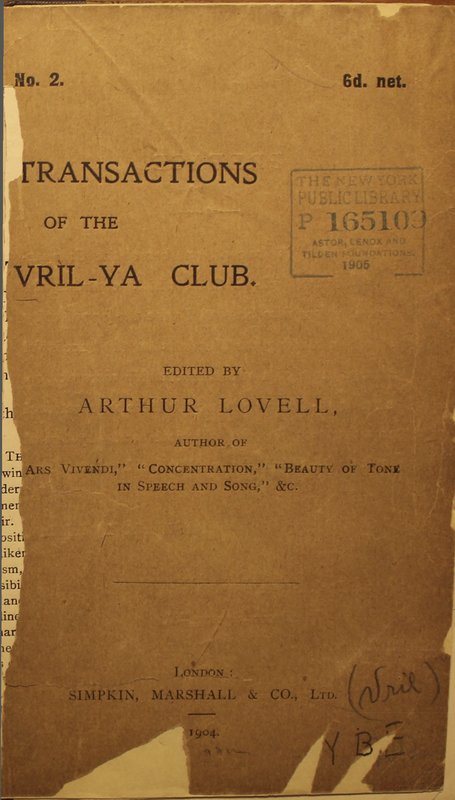 He started the Vril-ya Club at the Modern Gallery on Bond Street in London on October 13, 1903, with a large crowd in attendance to hear him discuss "the cultivation of a manly spirit on the lines foreshadowed in Lytton's romance, 'The Coming Race.'" According to the account in Punch, the Club's purpose was to "study organic force in all its aspects" and to "generate more vril than has hitherto been apparent." This was to be demonstrated through practical experiments with magnets and electricity accompanied by dramatic representations to illustrate the "stages of individual and racial development." For those who "desire to penetrate more deeply into occult science[,] facilities [would be] afforded for theoretical and practical instruction." practical cultivation was to include sun-tanning, moon-bathing, deep breathing, care in choosing one's clothing and surroundings and the like to increase the Vril, and students were encouraged not to sleep athwart of the nightly flow of magnetic energy from south to north. The first issue carried accounts of the group's plan, and the second (and last) was devoted to members' discussions of "Reichenbach's Researches," with short contributions by Lovell, Comtesse de Brie, Mrs. J. Stannard, and H.W. Taylor. NYPL; BL; National Library of Scotland.